This is literally my favorite time of the year. I don't even realize that I am in a funk, and less than excited / needing rejuvenation until the colder weather starts dissipating and the sun and 70 degree weather starts making an appearance from time to time. The idea of warm weather gets me excited to start dressing for it, but then it is often times so cold in the morning what I want to wear for 2pm does not work for 6:00am or 5:00pm for that matter. So, what do you wear during this awkward in between Winter and Spring time frame? I am giving you a few glimpses in to my wardrobe over the past few weeks - and linking some of my favorite brands for inspiration! Lightweight sweater in one of my new favorite brands Treasure and Bond which is a Nordstrom brand that I love - every piece is casual, fits well and can be dressed up or down. The Adella Longline bralette EVERY ONE is wearing from Free People because it is just that good. It is a perfect spring layering piece. You cannot see how cute my booties are in this picture, but they are cute... and green suede which I love green everything, so right up my alley. The brand is Rebels and I bought these at my friend's boutique in Fort Collins that I constantly rave about. This entire outfit is just every single thing that I wear on repeat, put all together in one. The Free People shoes I have in two colors: I am obsessed with neutrals, so I wear these shoes on the daily. They are open a bit so they're not great for snow or winter months, but now that it is warming up they are perfect. My denim is a washed grey/black and I found a similar pair here, these are old! They are Mother brand denim and they fit like a glove and are flattering for women with some junk in the trunk like myself (I'm not hating, I'm just saying). This light weight V neck sweater/long sleeve tee I have in two sizes, and it is the most comfortable thing I have ever worn. I promise, outside of silk pajamas you won't find anything that is this amazing to wear. Lastly I bought this vest at Hey Day here in Fort Collins! And it is old but I am sure there are tons of similar vests online. 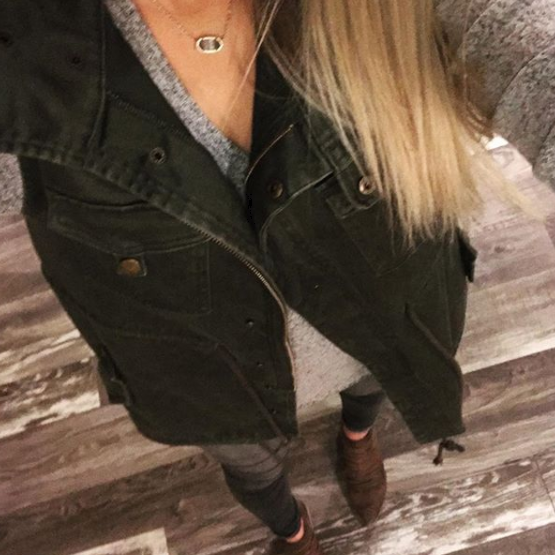 Overall, dressing this time of year can be difficult but throw on a light jacket and some layers and call it a day. You cannot go wrong with sweaters, denim and booties up until May here in Colorado!